The Earth gets smaller as we move further away, until it’s a small blue disk in a vast ocean of black. 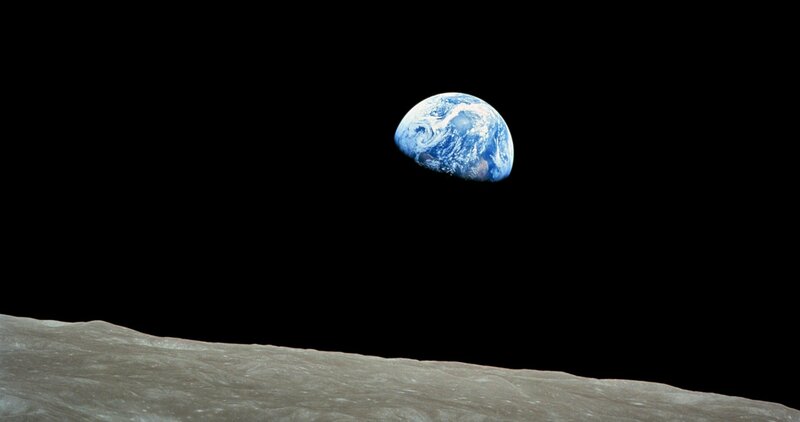 The moon comes into shot and we see what the Apollo astronauts saw and photographed in 1968, the image known as Earthrise that was the inspiration for the modern green movement. It looked so fragile. One of the astronauts said it made him realise that everything that had happened in his life and in anyone’s life had happened on that small blue disk. Imagine you’re one of those Apollo astronauts. You glance down at your instruments and then, when you look up again, you see that the small blue disk has gone. The camera retraces its steps, leaving the moon and heading off through the darkness. After a while we see a hazy grey disk in front of us. Getting closer and it looks like dust, but closer still and we see cars, and people and cats and dogs and dust bins – everything that wasn’t fixed to the ground is now floating in space. People are still alive, gasping for air. Some people are clutching one another. A dog is barking.